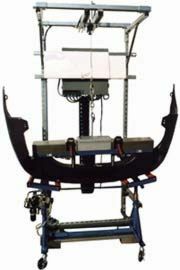 As shown here, Technus has the design capability to produce operator safe and ergonomically correct workstations for virtually ANY size parts. Our customized manual and power assisted workstations have built-in features that guarantee assembly to your desired quality standards. Technus design and build a variety of standard and special in-line workstations, many equipped with table top conveyors to move components to the operators various positions. These workstations typically utilizing aluminum extrusions construction and SKF Flex-Link delivery components. 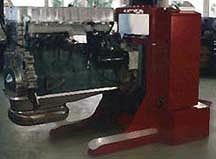 Technus also builds larger and more complex ergonomic workstations, such as this large engine assembly fully mechanized work station with power travel capability. These are ideally suited for unobstructed cantilevered suspension of heavy assemblies, such as compressors, engines, axles, gear boxes and a wide variety of other very large component that need to be assembled with production line efficiency. 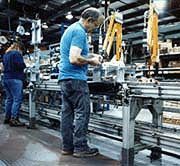 These powered work stations typically have the capability of lifting and lowering to each operator convenient assembly height as well as rotating the parts for complete freedom of access need to move through many assembly stations for completion. Assembly weights are simply not an issue to us.